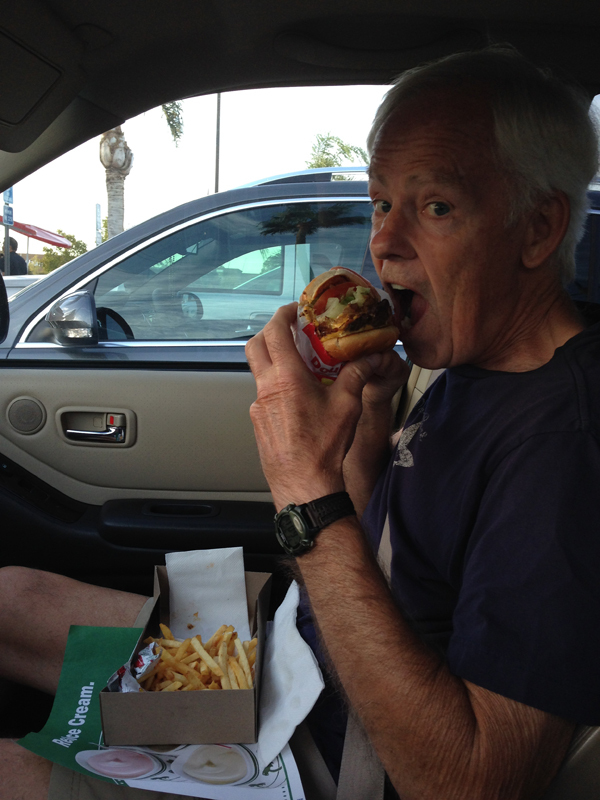 9/25/15 – Dinner – my first In-N-Out Burger – a very healthy Double-Double with a side of vegetables! 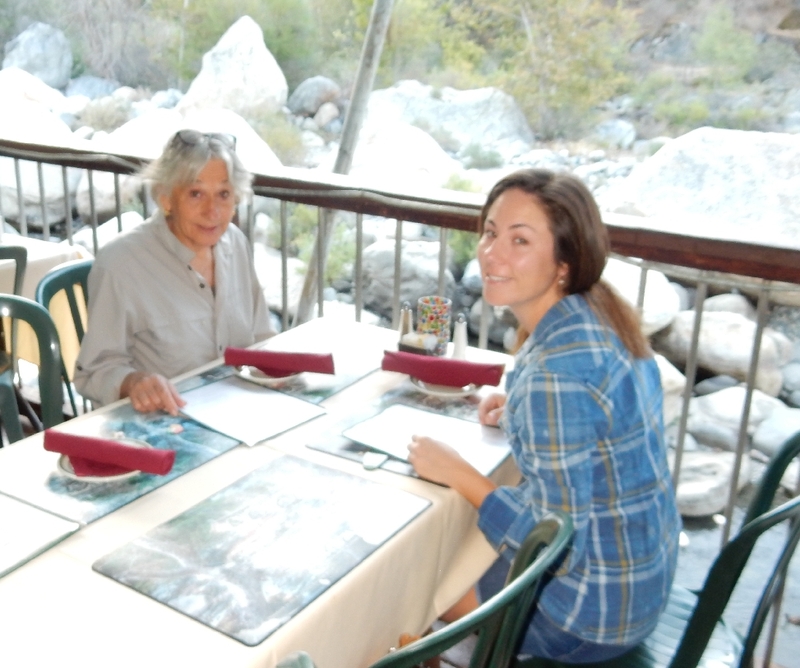 9/26/15 – We were up and packed by 7:30 but had to wait until 8am for the Gateway Restaurant to open for breakfast. 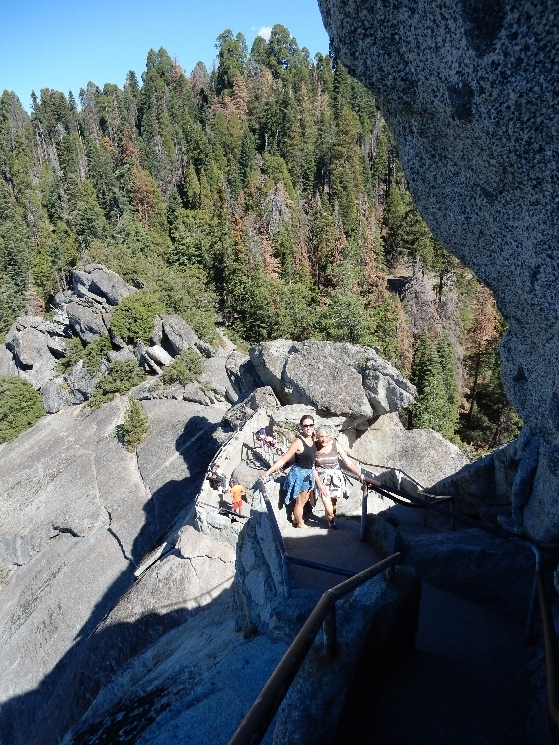 We opted to look at, rather than eat at, the table on the rock! 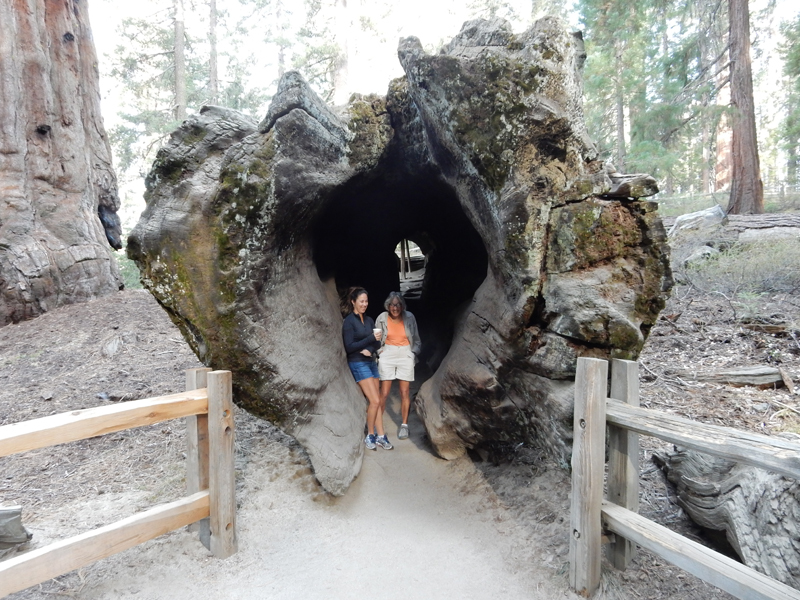 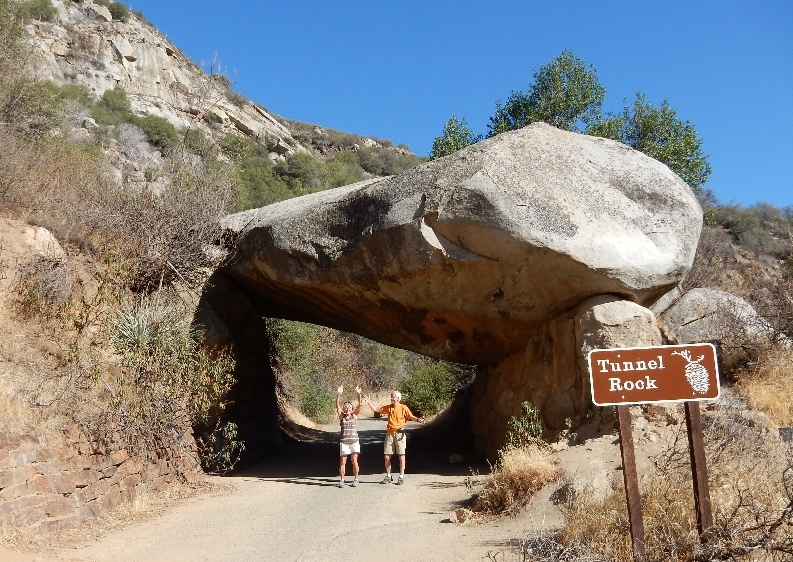 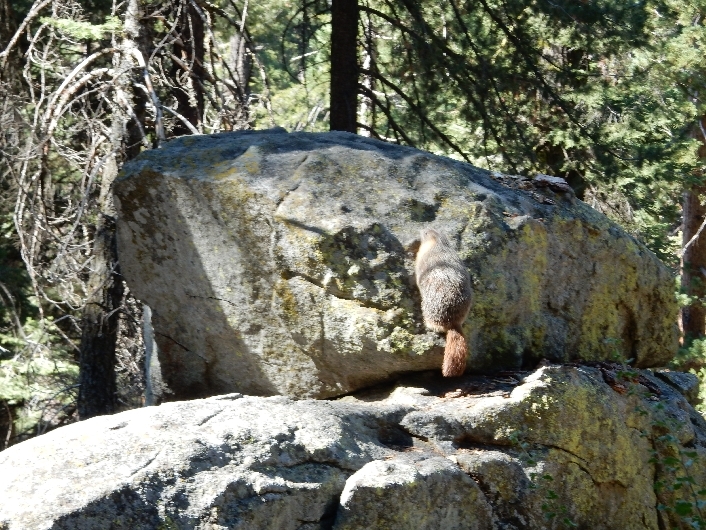 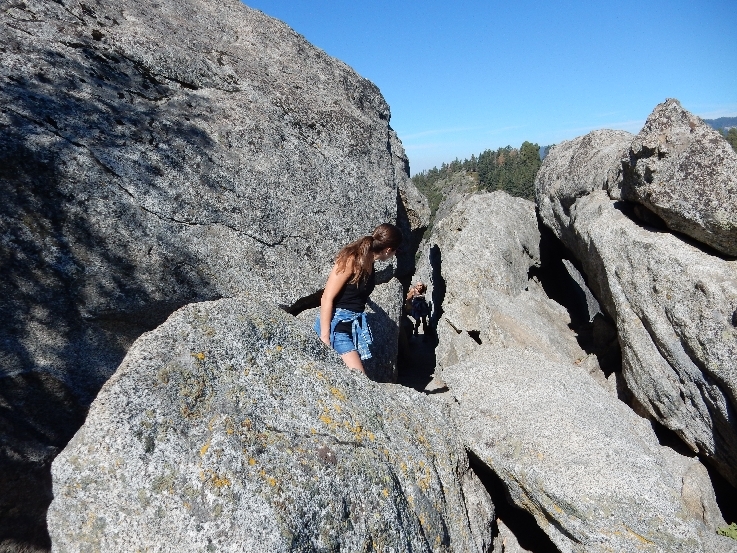 Our first stop was Tunnel Rock – couldn’t quite hold it up! 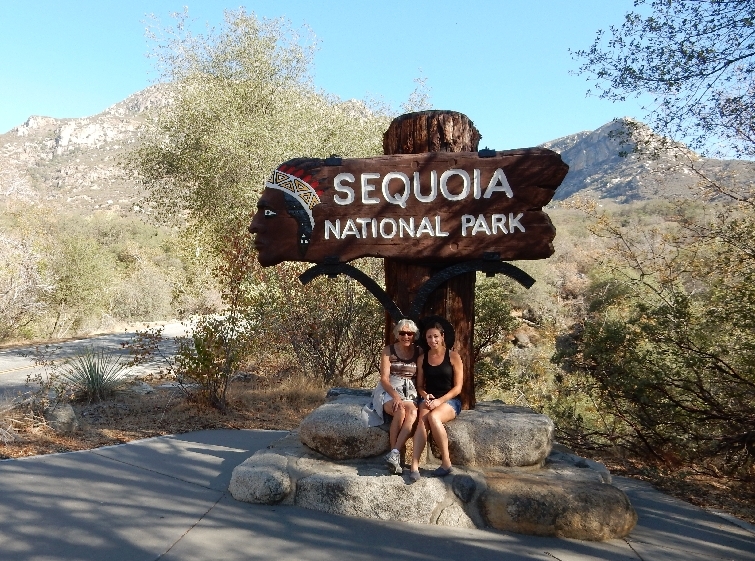 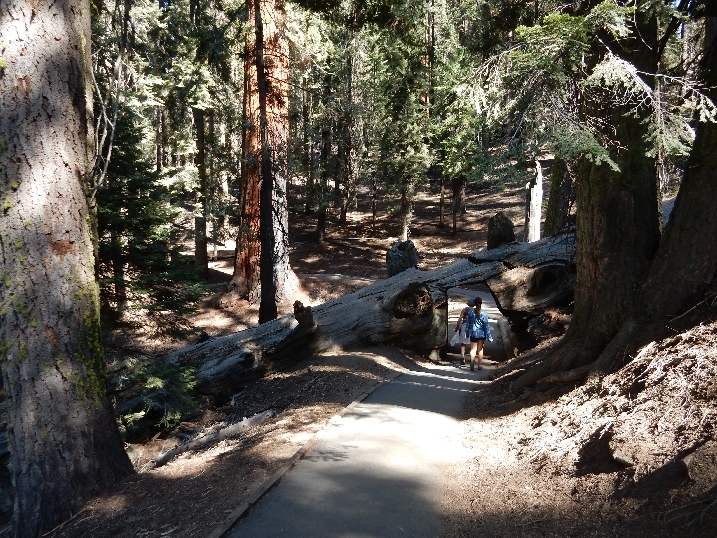 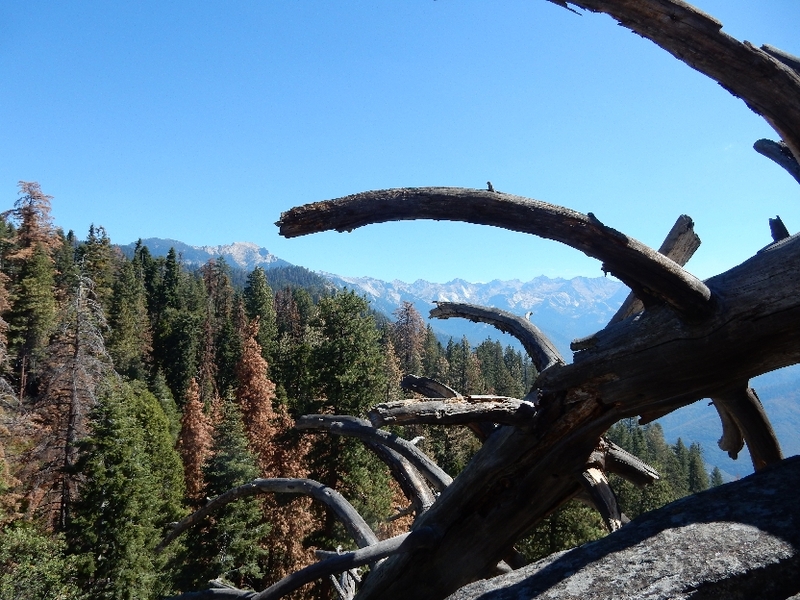 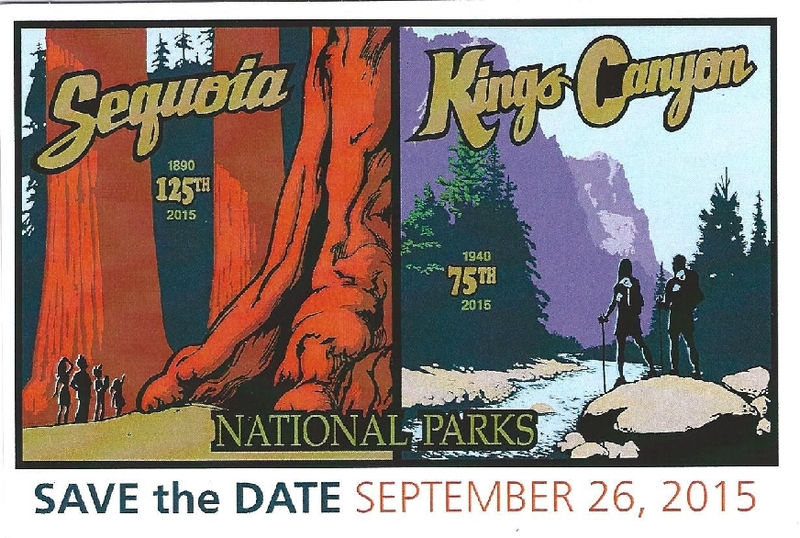 September 26, 2015 was the celebration for the 125th anniversary of Sequoia NP and the 75th anniversary of Kings Canyon NP. 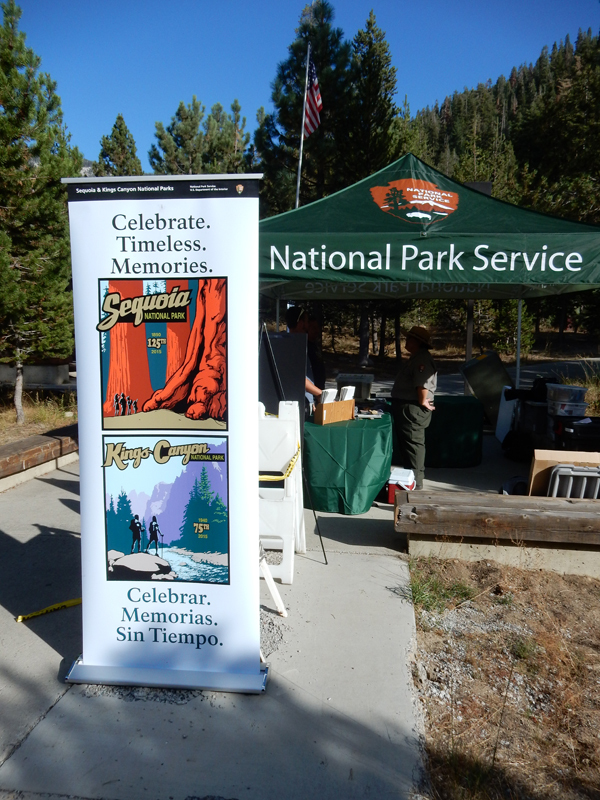 The celebration, the unseasonably warm weather and the fact that today was a “Fee-Free” day because of National Public Lands Day, resulted in a large number of people in the park. 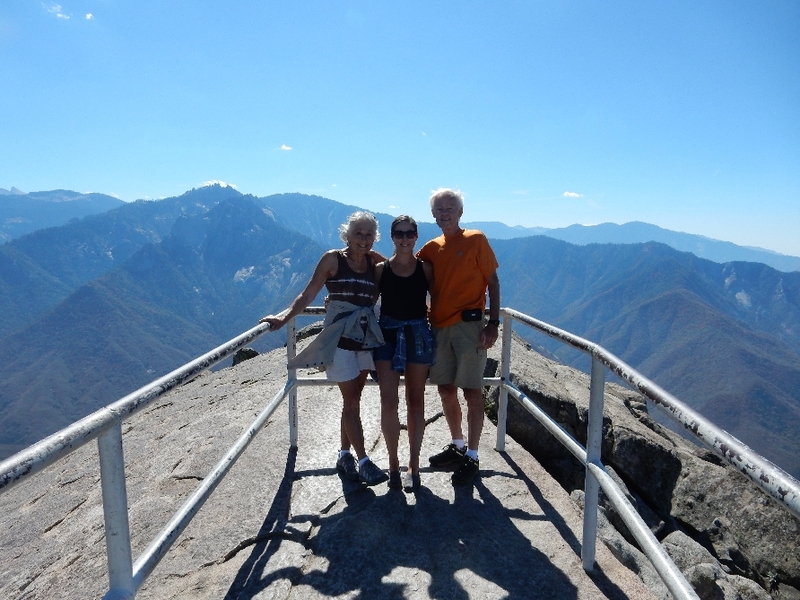 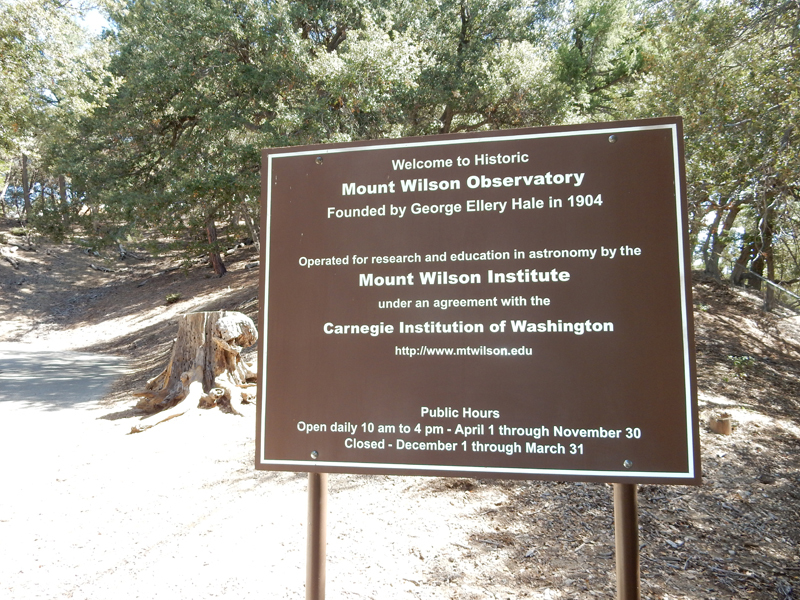 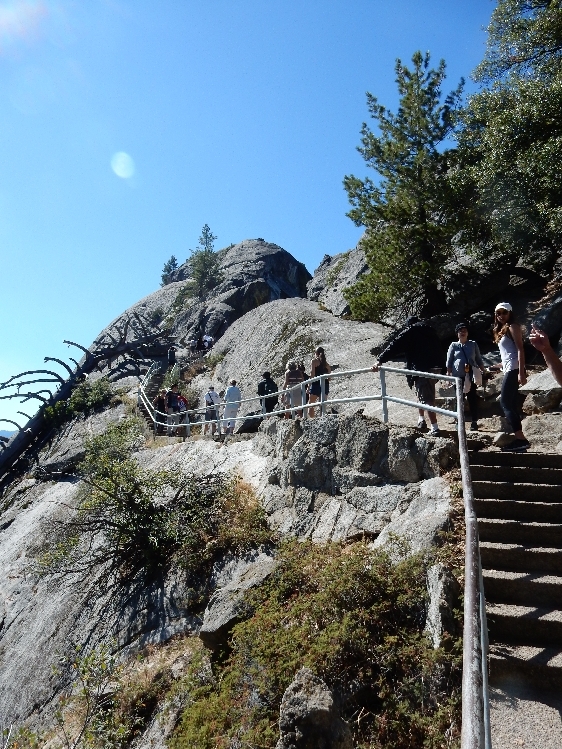 As a result we could not drive on the Crescent Meadow Road and had to take a shuttle to Moro Rock. 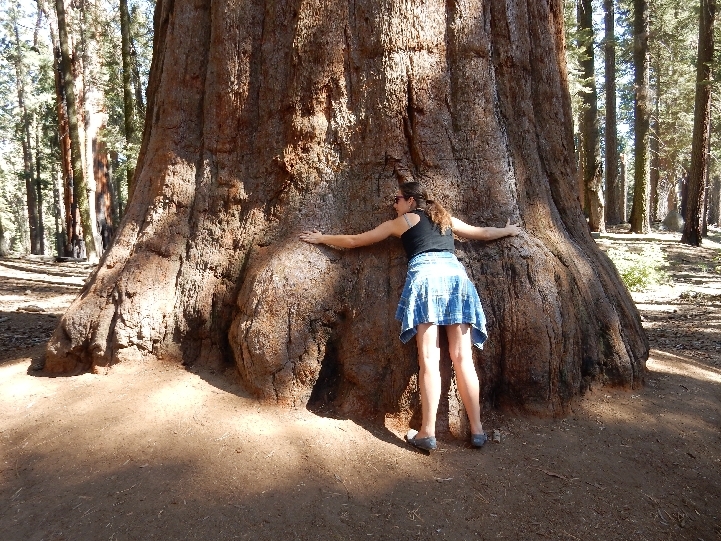 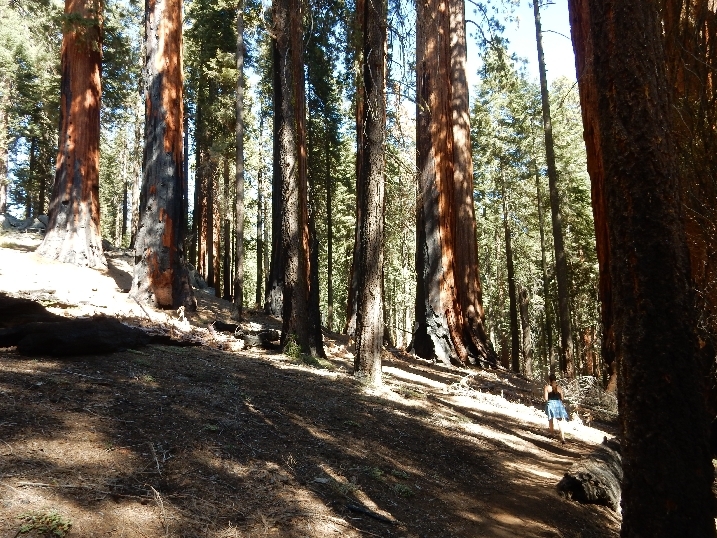 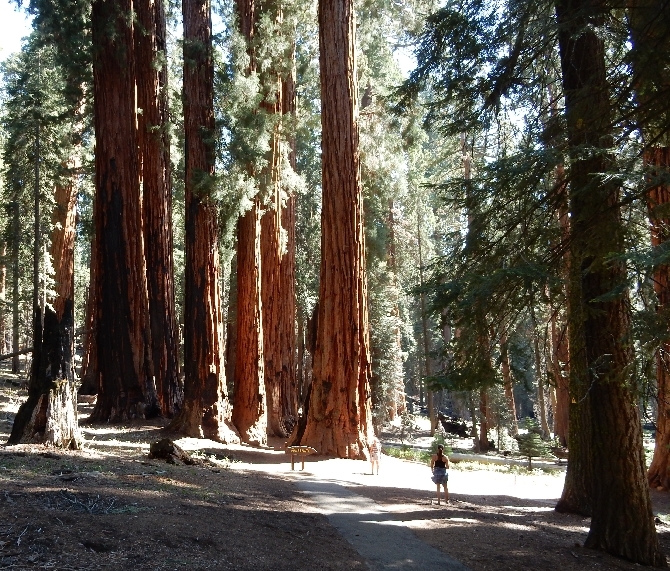 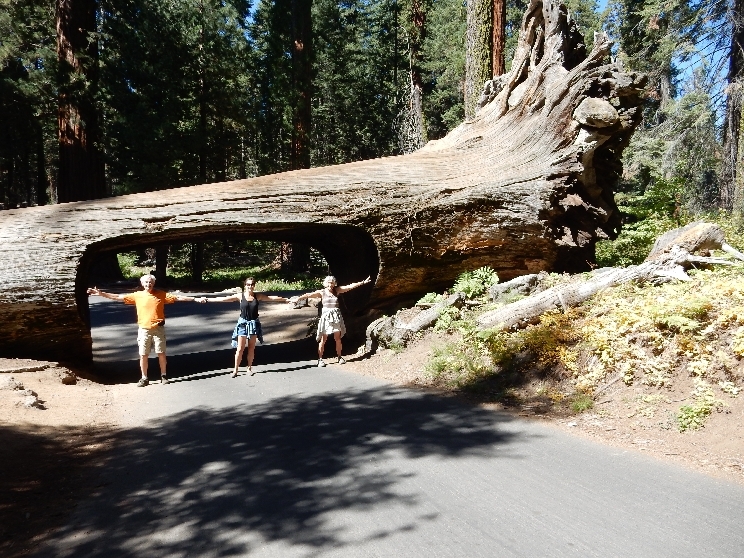 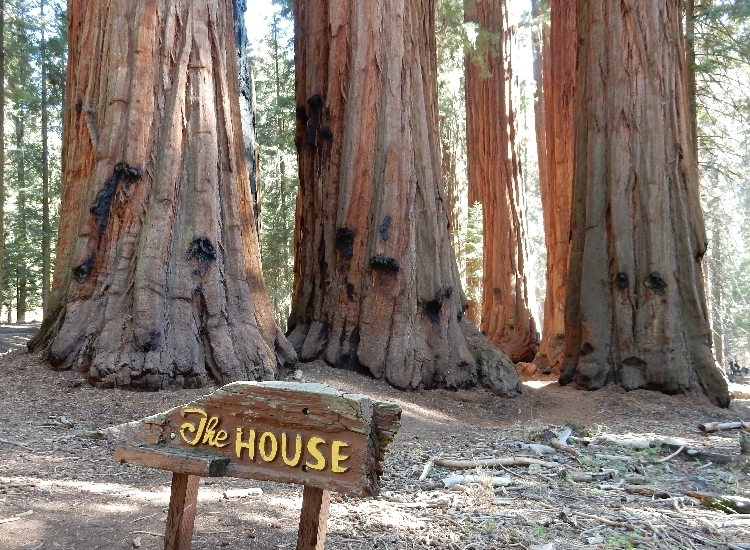 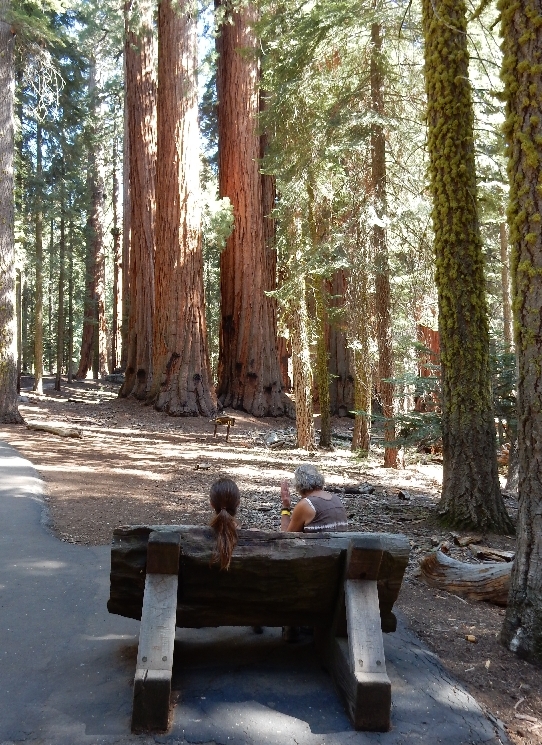 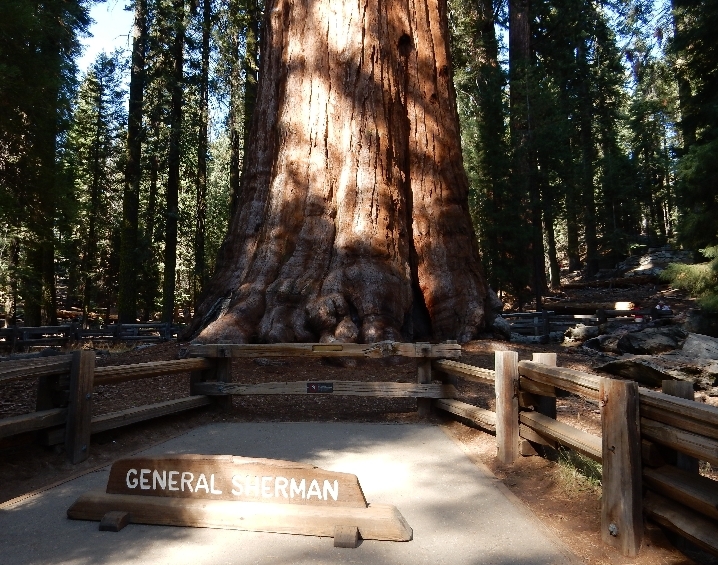 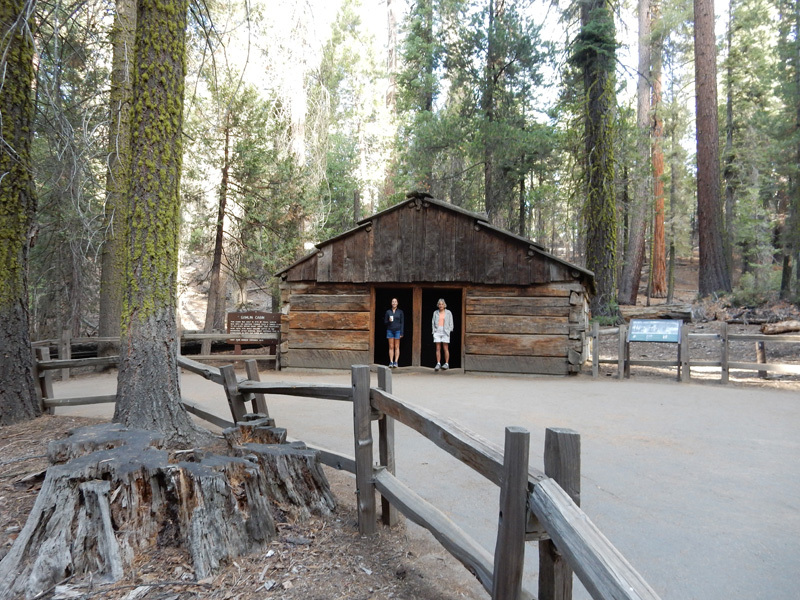 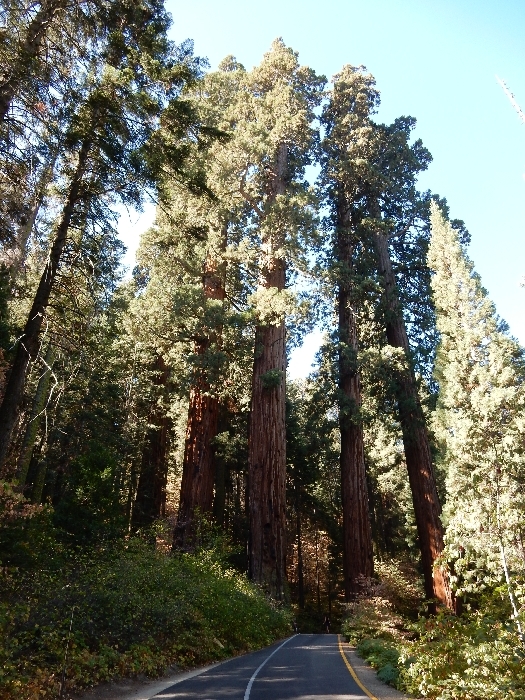 General Sherman Tree – “World’s Largest Living Tree” – based on volume of total wood. 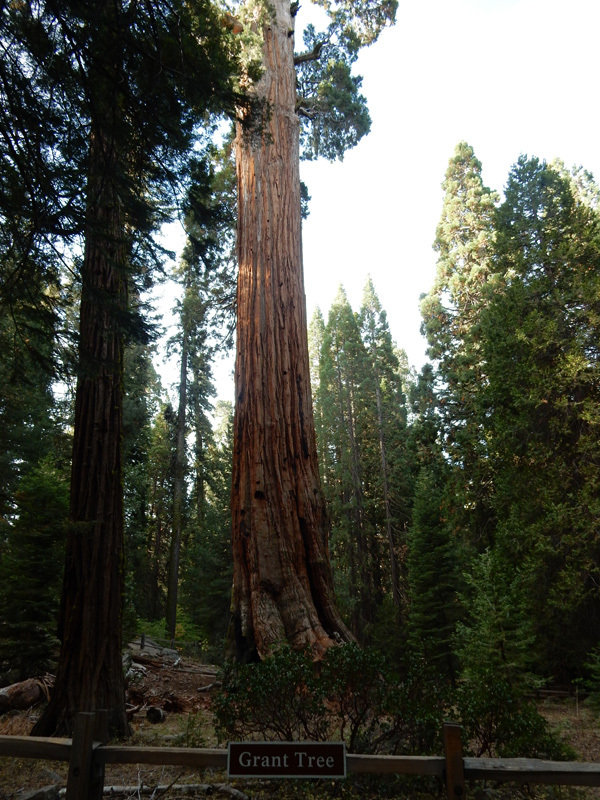 It is estimated to be 2,200 years old and each year it grows enough new wood to produce a 60-foot-tall tree of usual size! 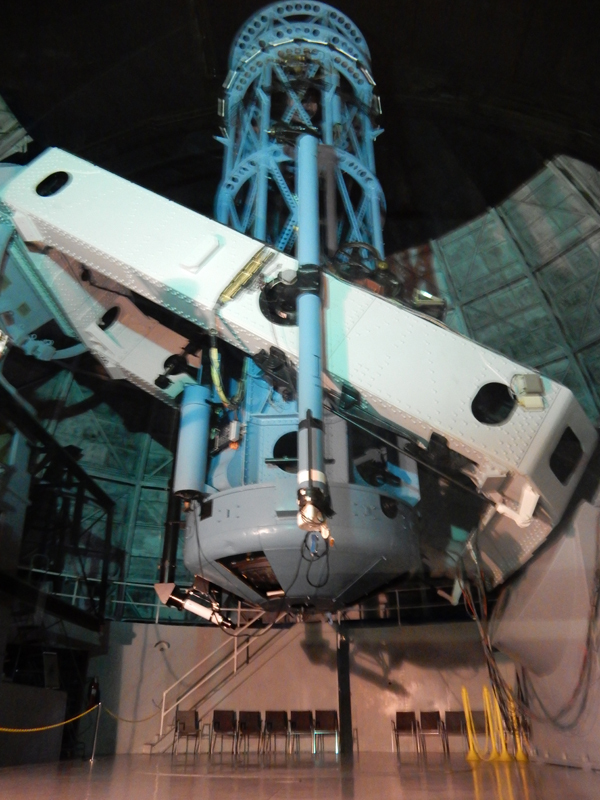 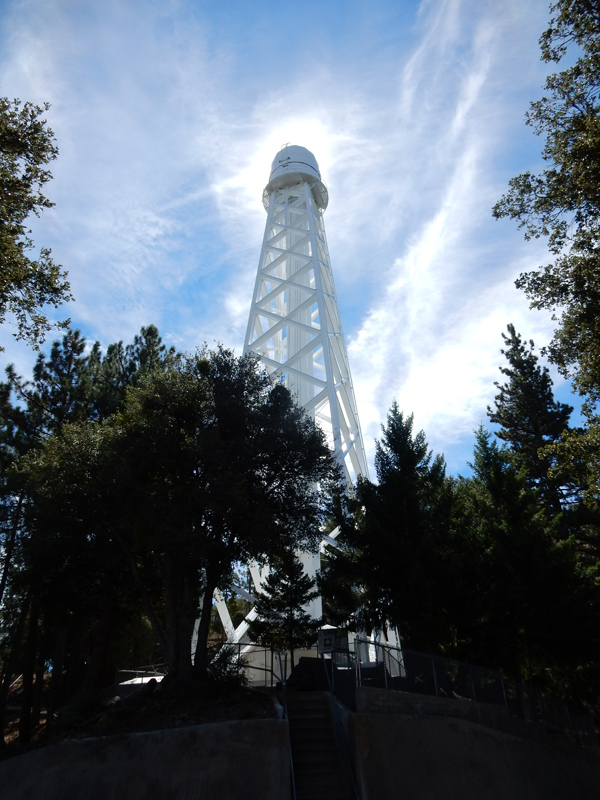 It is 275-foot-tall and has a circumference of 103 feet at ground level. 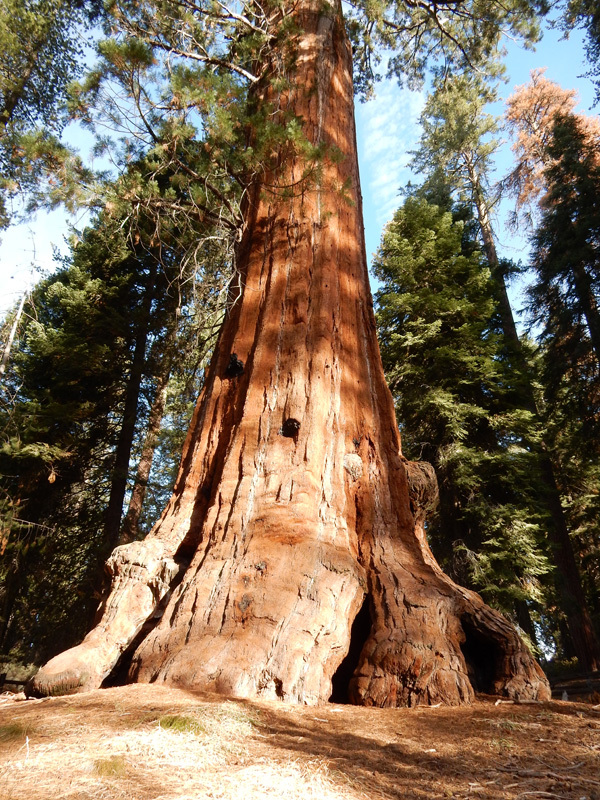 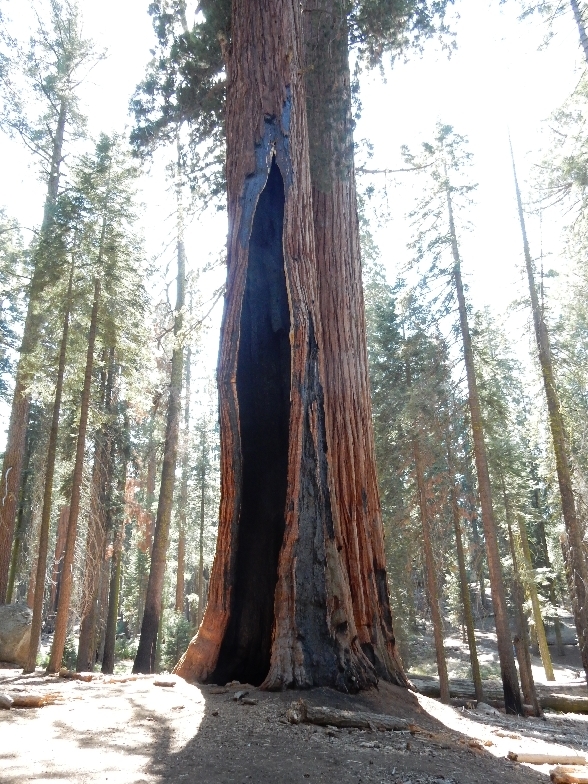 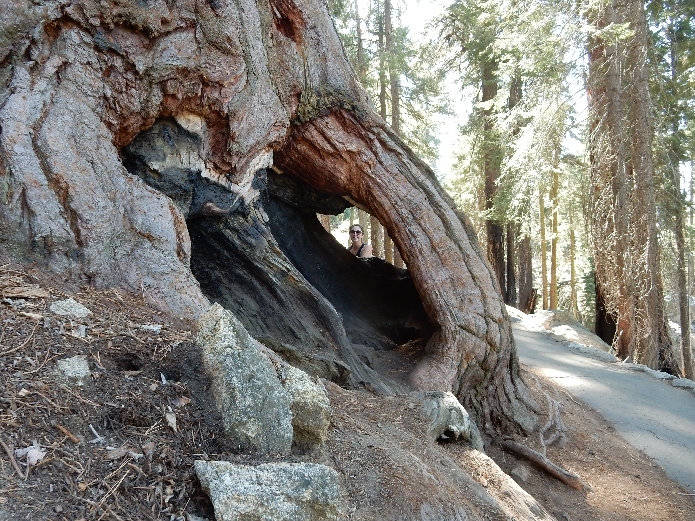 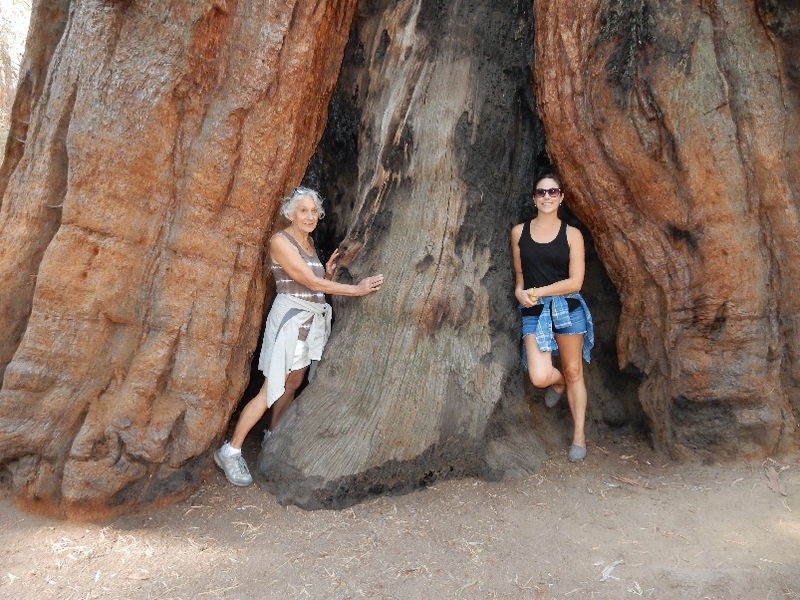 Sunny side of General Grant Tree- the “Nation’s Christmas Tree.” It is the second-largest sequoia in the world. 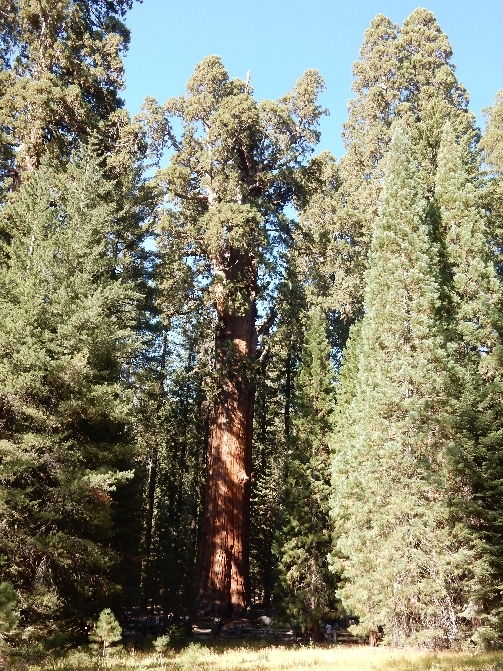 It is 270 foot-tall and has a circumference of 107 feet at its base. 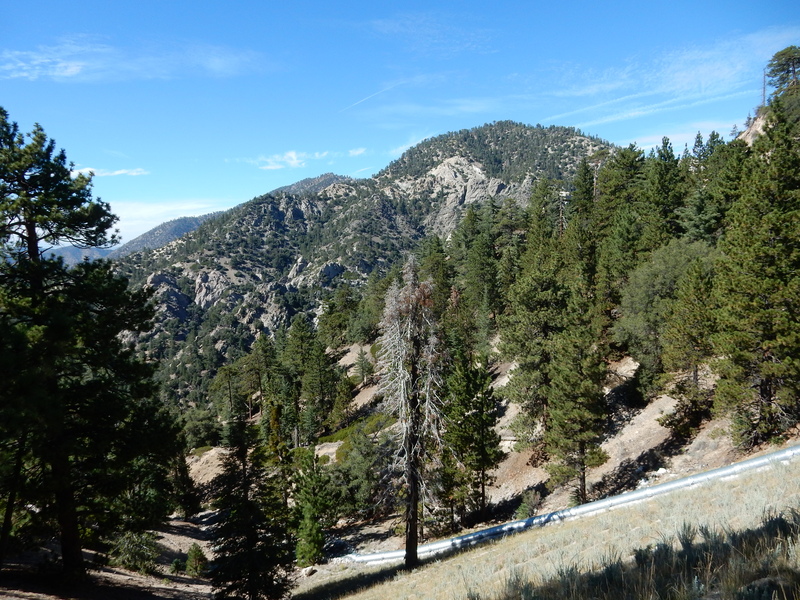 Had breakfast in Grant Grove Village and then did the short hike to Panoramic Point for a view of the Sierra Nevada. 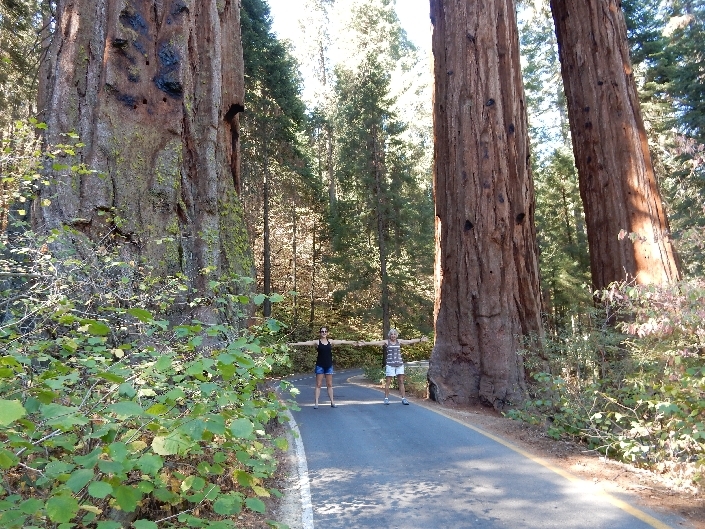 Drove to the Redwood Mountain Grove, where Chad and I had hiked in 1998, and then had an adventure following Google Maps (gravel Forest Road not on maps) to Eshom and onward to LA. 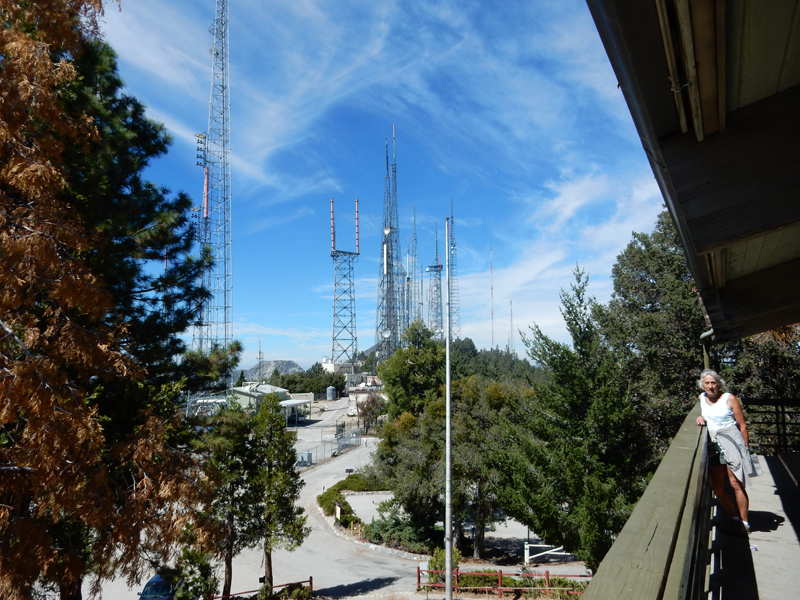 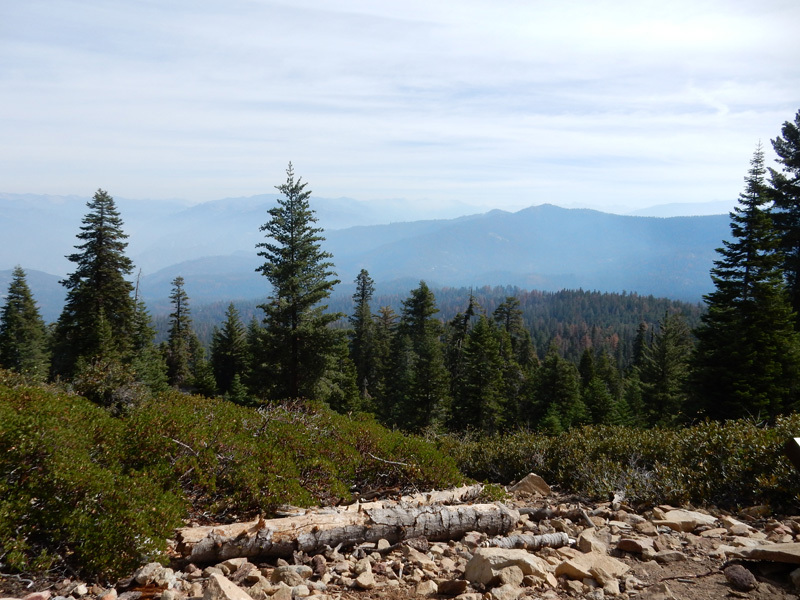 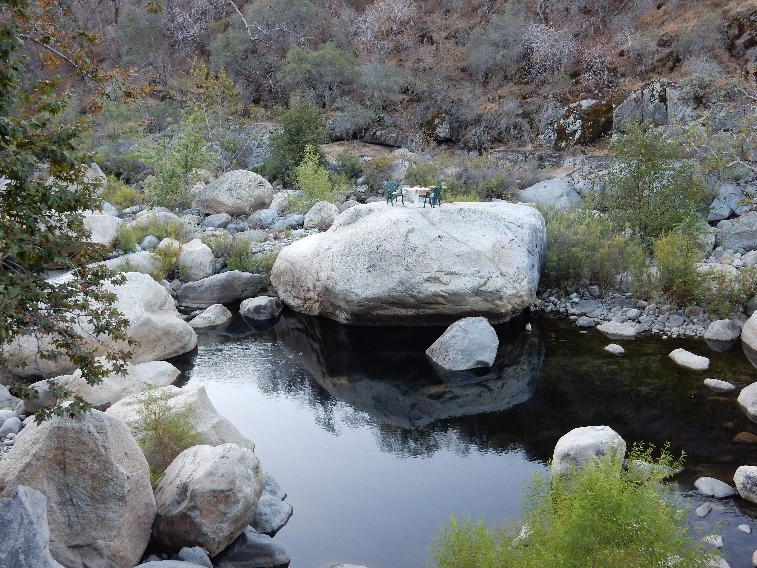 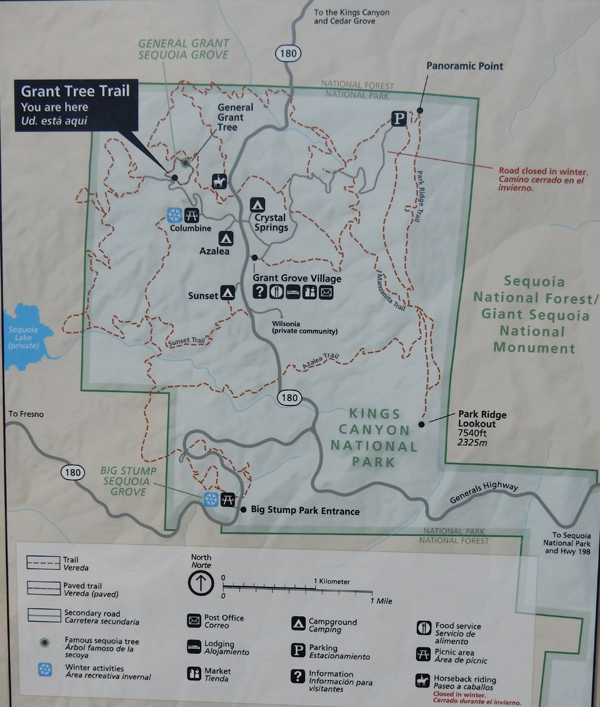 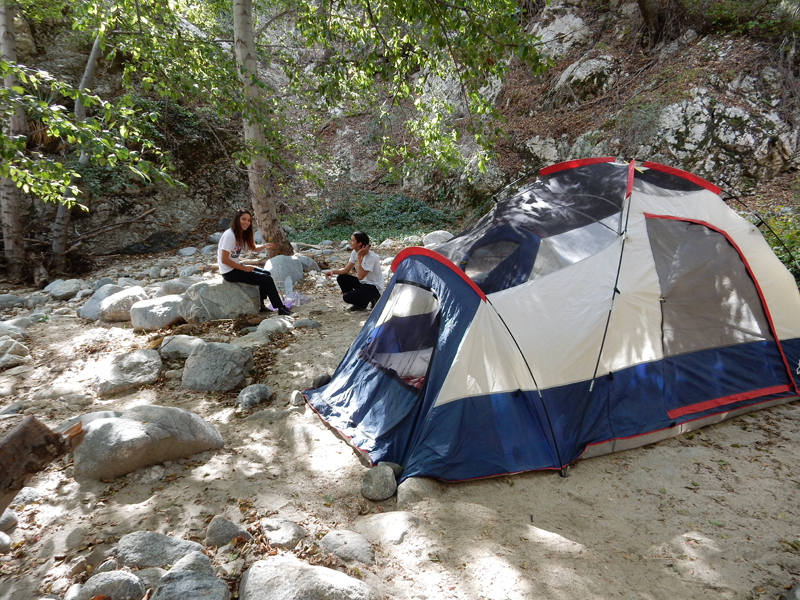 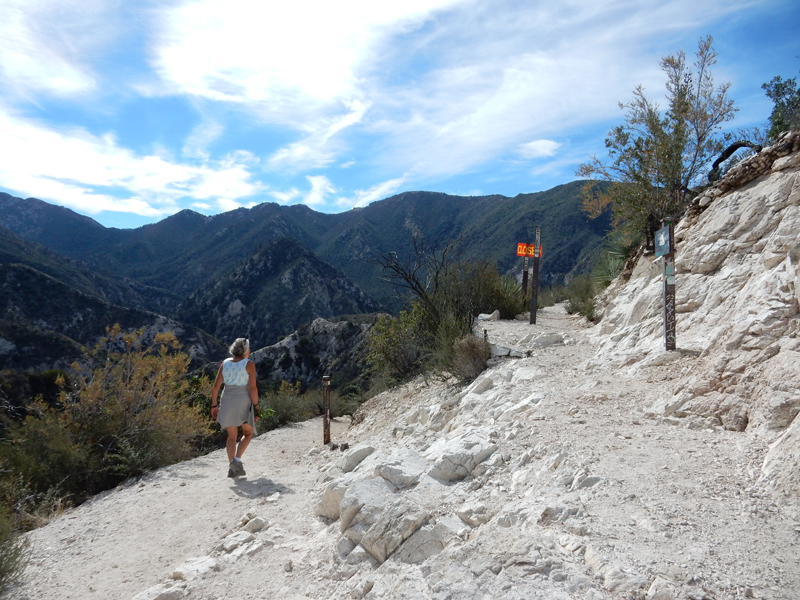 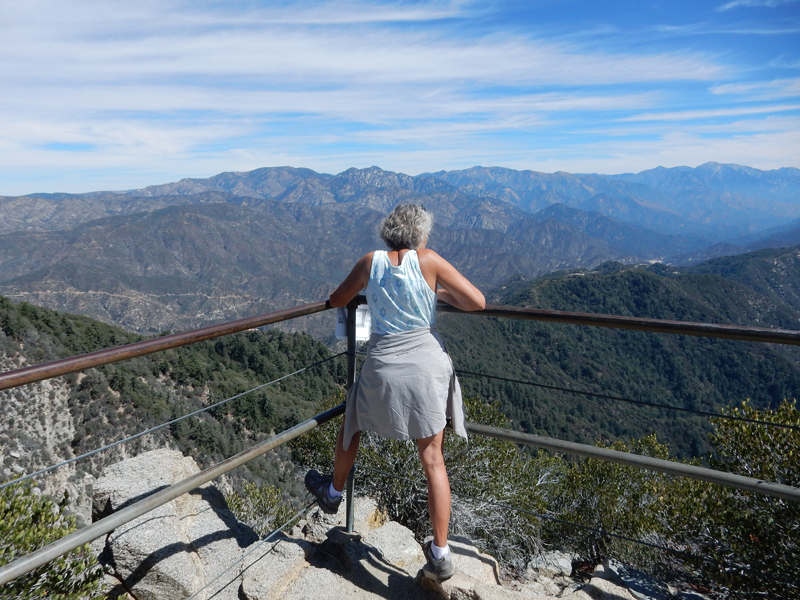 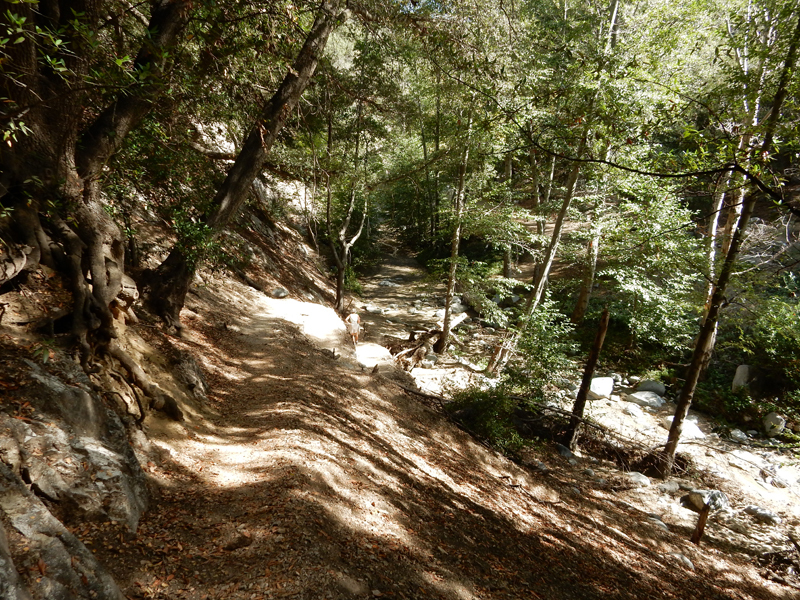 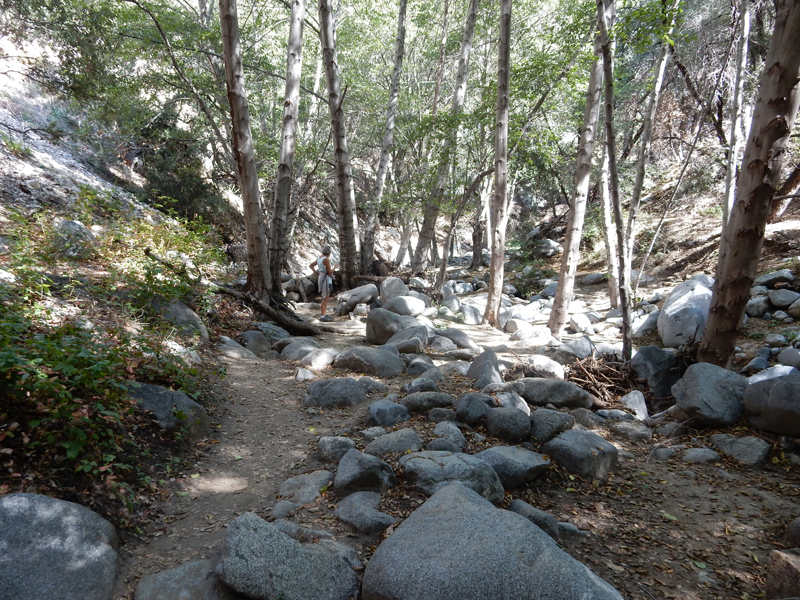 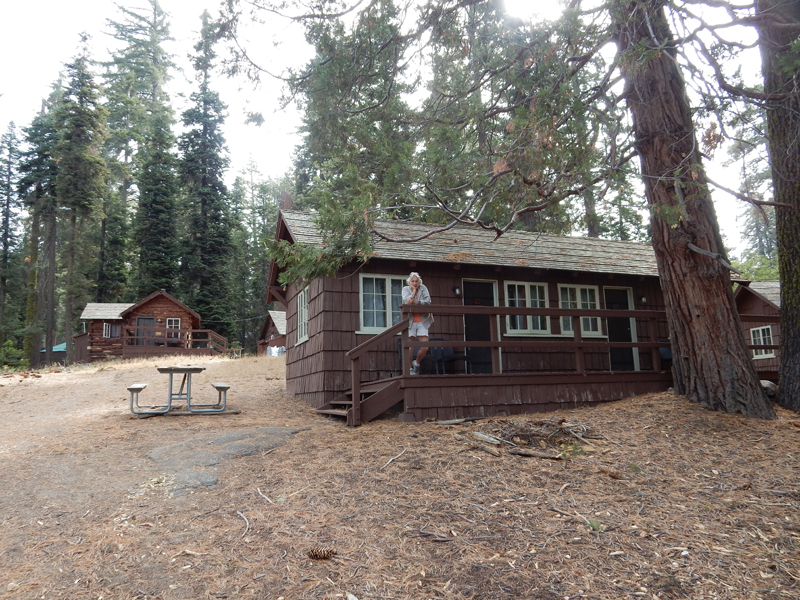 9/28/15 – picked up our rental car at 8am one block from Kate’s house and drove to CA Rt 2 (Angeles Crest Highway), which passes through the new (2014) San Gabriel Mountains National Monument administered by the USFS. 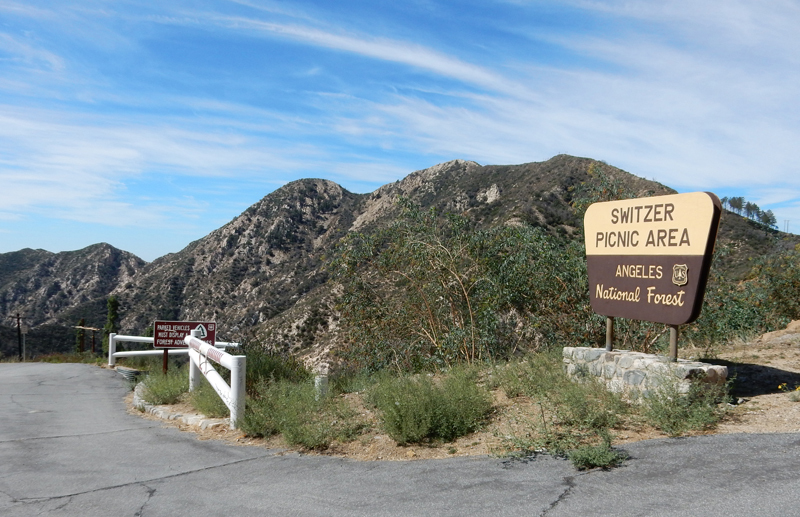 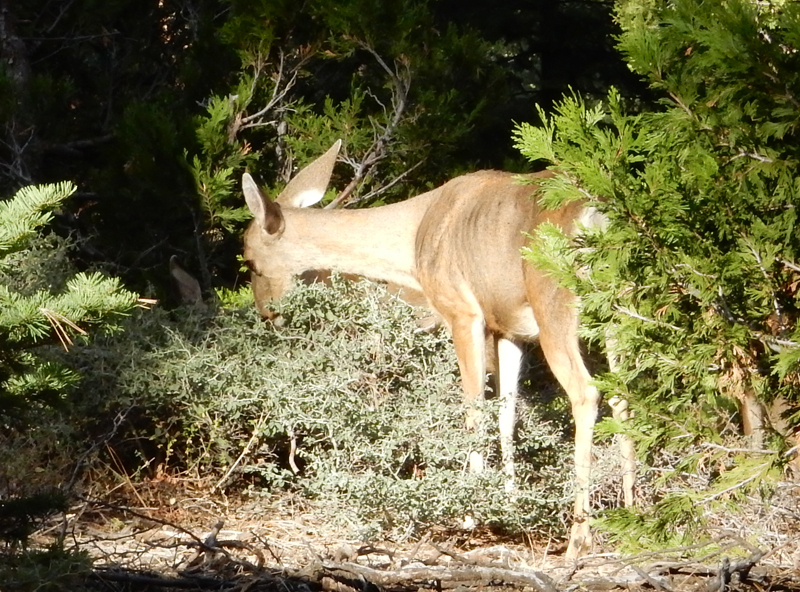 Stopped at the Switzer Picnic area. 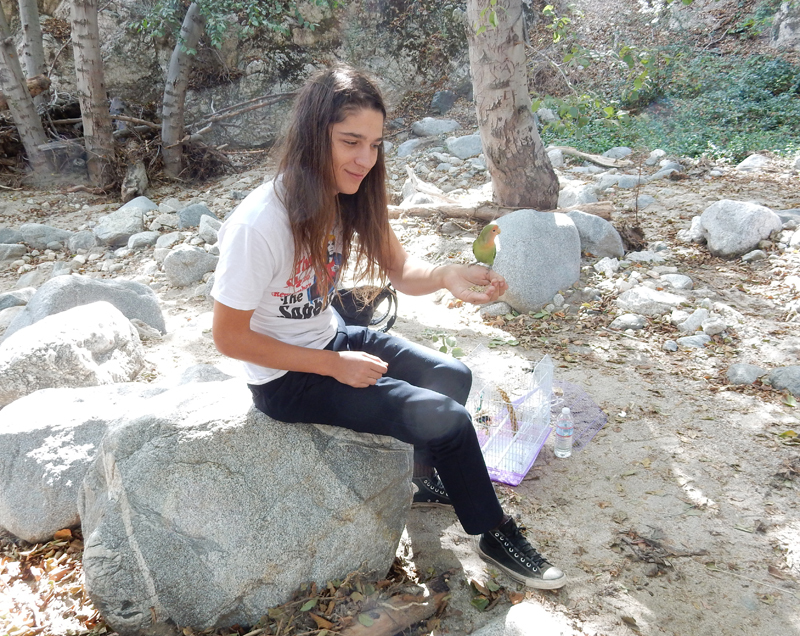 What makes the caged bird sing? 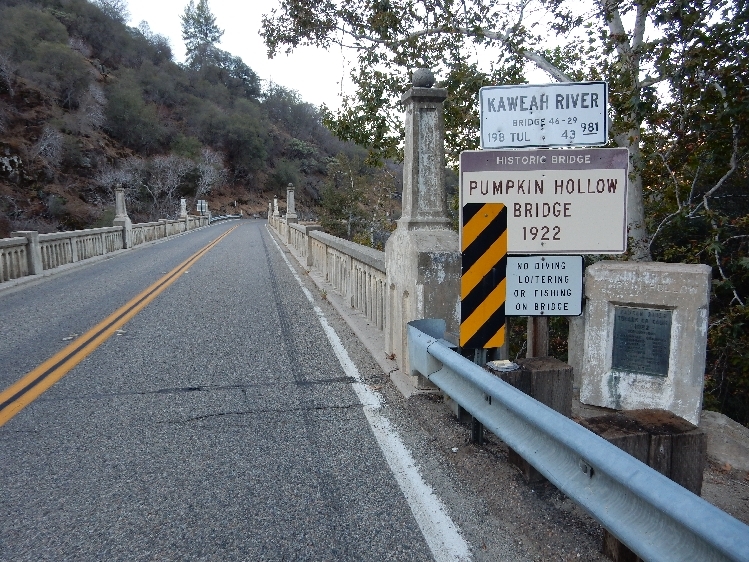 We then drove east on Rt 2 until we were stopped by a police barricade because a film crew was working down the road. 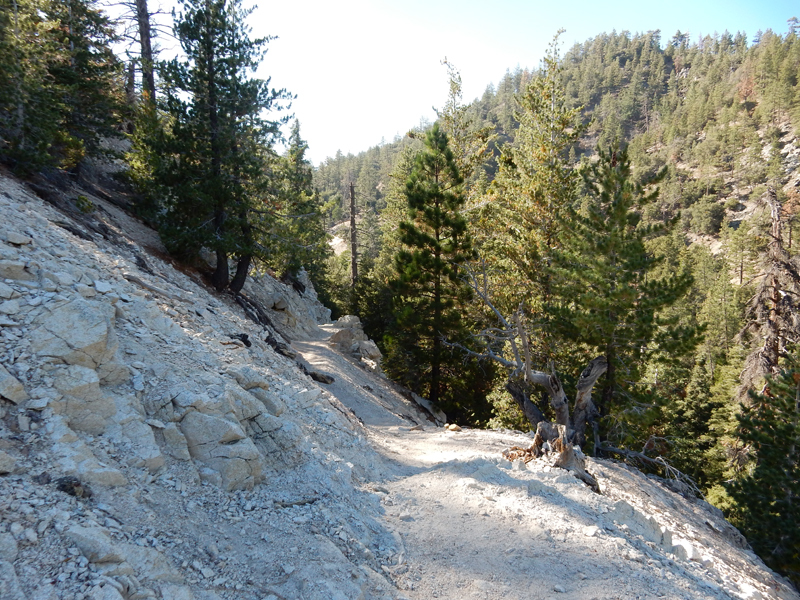 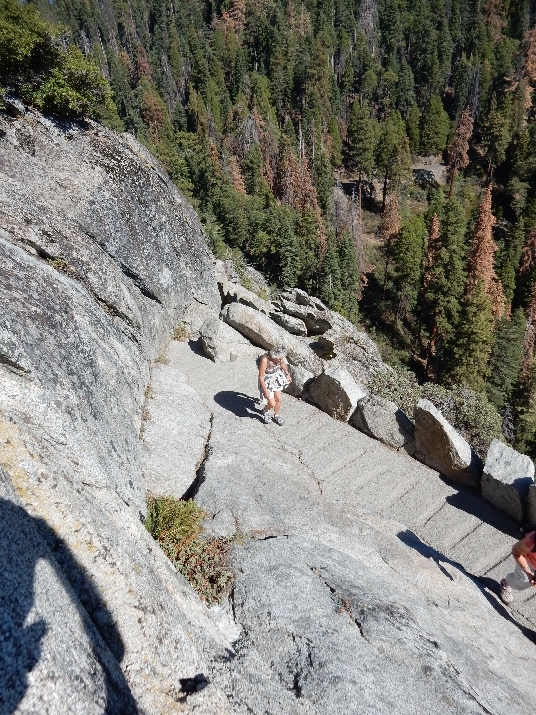 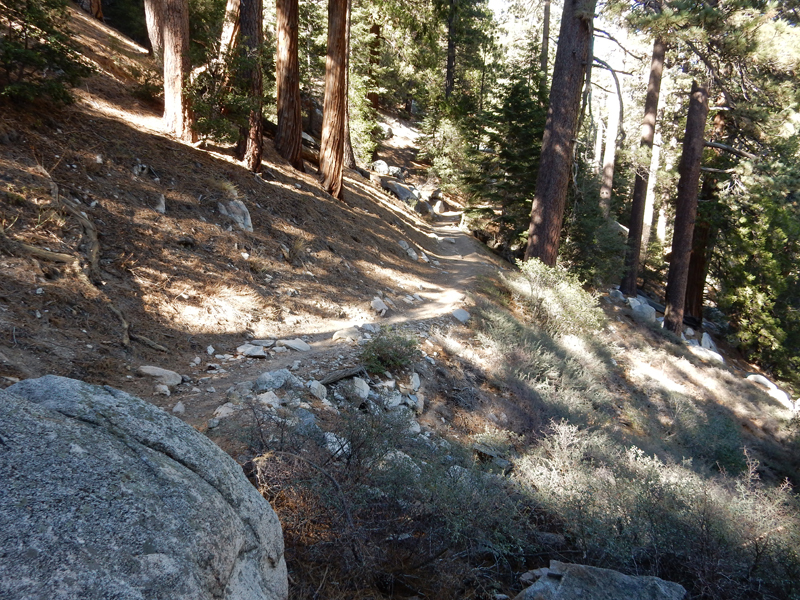 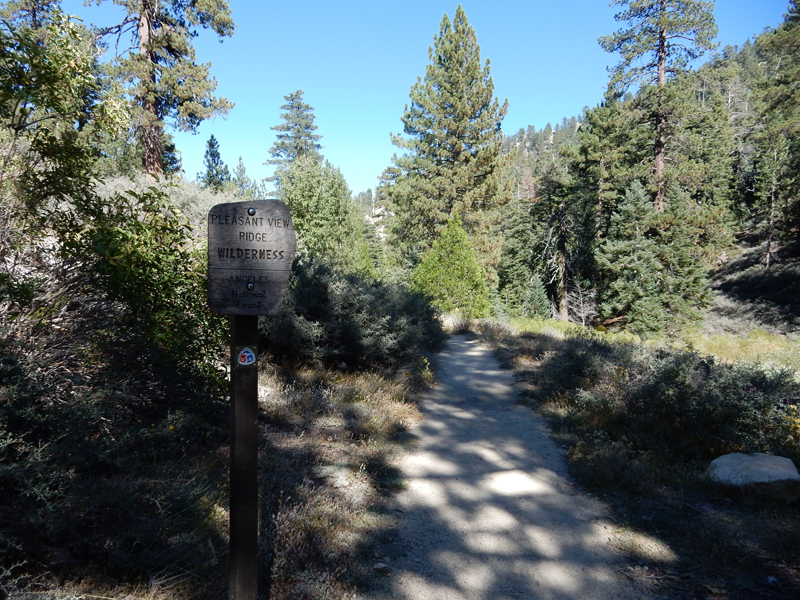 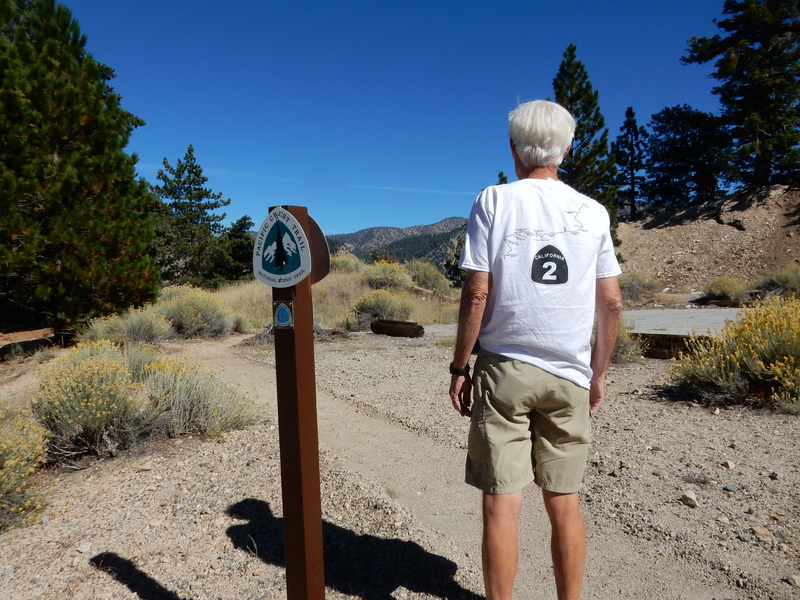 It happened to be at a point where the Pacific Crest Trail crosses the road. 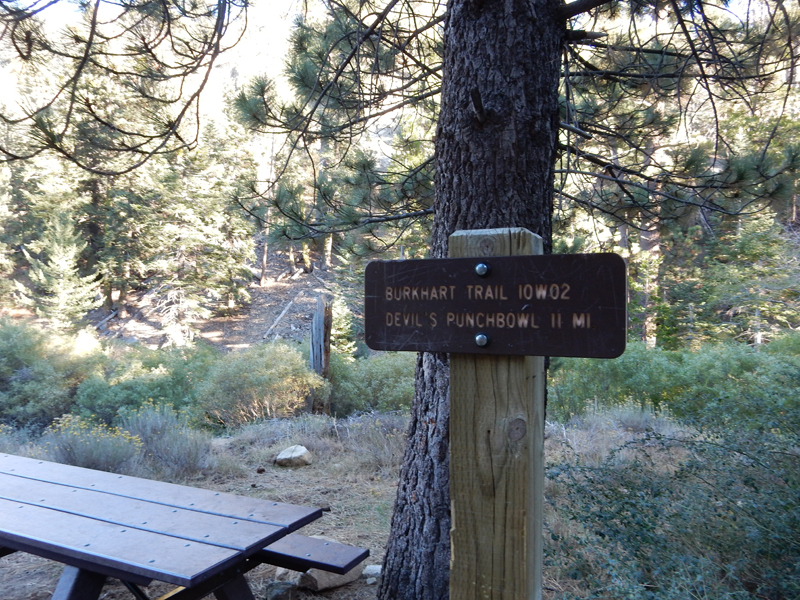 There was a good view of the distant Devil’s Punchbowl north of the road. 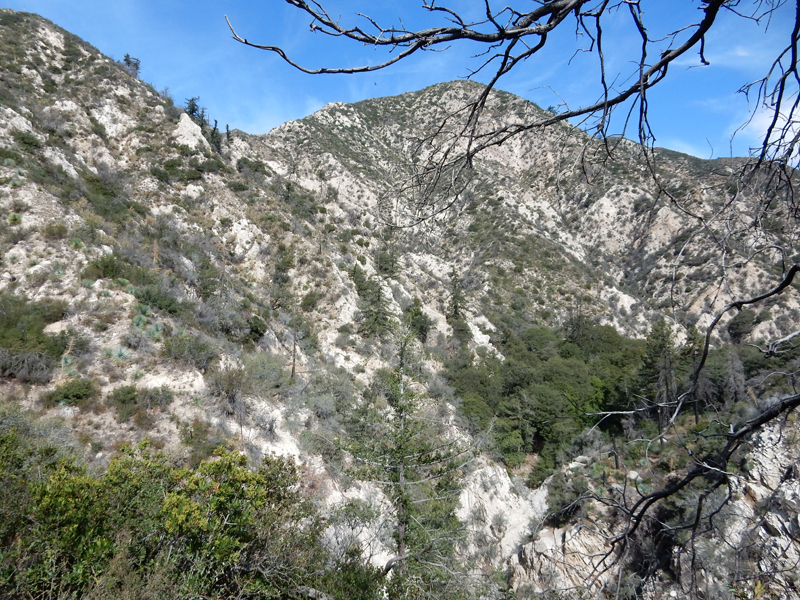 We had hoped to hike there but will have to save that for another day. 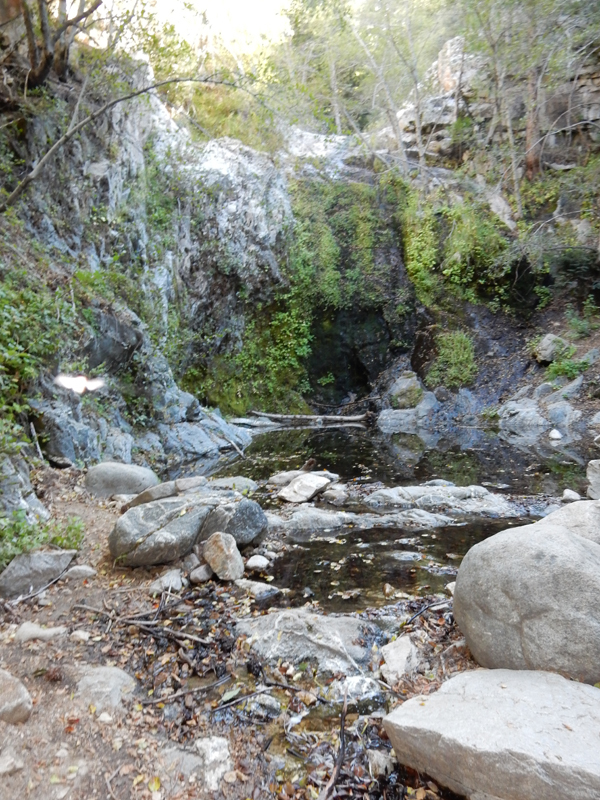 I did not see the drop into the canyon for the falls and hiked about a half mile until I realized that I must have missed it. 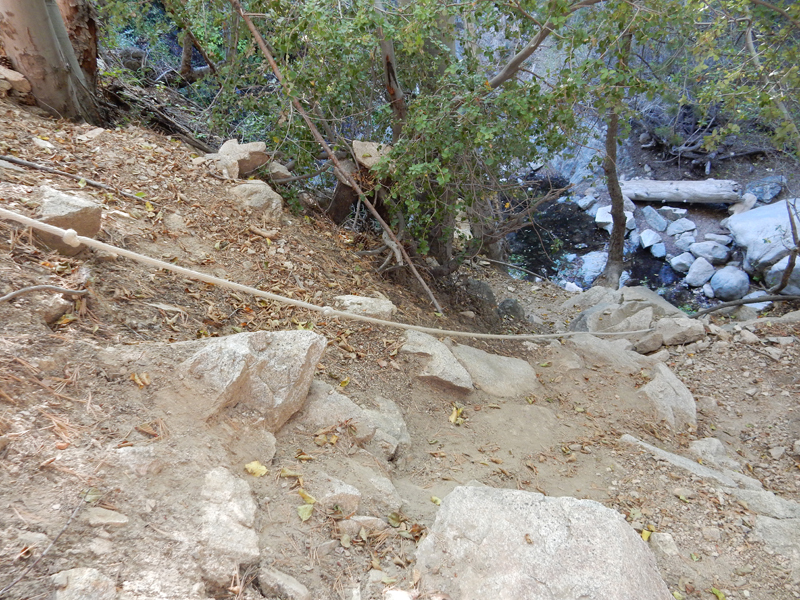 I headed back and discovered a rope to aid the climb down into the canyon. 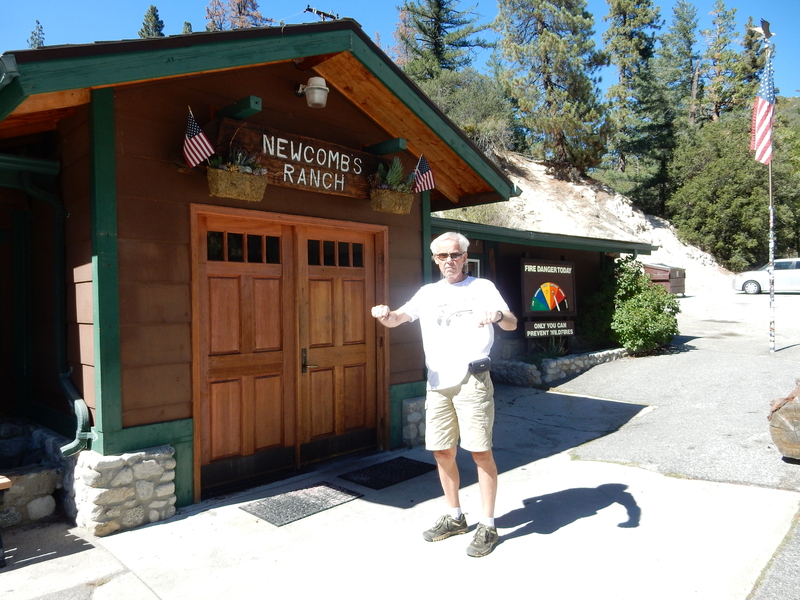 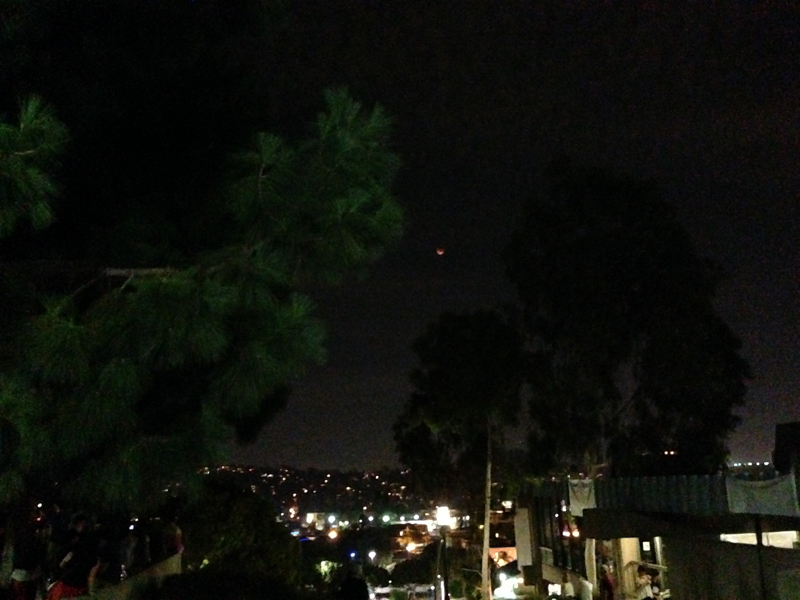 You are currently browsing the The Martin's Blog blog archives for September, 2015.